If your in to modifying your own car then your going to need modified car insurance to make sure your legally covered on the road. Modifying your car can be fun and an excellent hobby to boot, not to mention if you can get good at it, you can make a pretty good living from modifying other peoples cars. Their are many modified car insurance providers that think because your modifying your car, that your far more reckless and likely to have an accident. However their are also lots of insurers that understand that when you have gone to the time and trouble, not to mention the expense of upgrading your car. The last thing your going to want to do is wrap it around a lamppost. Modified vehicle insurance doesn’t have to be an expensive undertaking. We’ve seen cases when chip performance modifications have only a marginal effect on the cost of your modified car insurance. Through the insurance comparison service provided by Seopa to the Very Cheap Car Insurance website, you can get extremely cheap modified vehicle insurance, in particular, if your a young driver, you might find it can save you hundreds, if not thousands of pounds. Limiting Your Mileage – If your modified car is not your main car, then make sure you give a pretty good estimate of your annual mileage as you could save big time by reducing your miles that you input through your online modified car insurance form. Advanced Driving Test – This can be particularly useful if your a young driver and also have a modified car. If you have the advanced driving test or Pass plus course under your belt their is a good chance that you will also see reduced modified vehicle insurance prices. Garage Your Car – This will not only deter thieves from stealing your pride and joy but will also bring down the cost of your modified car insurance. Informing your insurance provider of your mods – You might be surprised to hear that certain modification’s can actually reduce your premiums, be sure to tell the whole truth when your modifications are concerned,. You may be pleasantly surprised by the results. When someone tells you that they are going to modify their car. Most often, they are talking about either performance modifications or cosmetic modifications. Let’s take a look at these modification types in more detail. This modification covers anything that will make your car either accelerate faster or have a higher top end speed. Certain modifications can also increase the torque (pulling power) of your car as well. these types of boxes are also reported to help with your fuel economy, which could result in a further annual cost or saving. This list is not exhaustive and their will certainly be other methods or increasing performance above and beyond the factory standard specifications. All of which would require you to declare your modifications to either your existing modified vehicle insurance provider, or to select the appropriate modifications when entering your details on our Modified Car Insurance UK online quote form. Dressing up your car and making it truly yours can be an enjoyable pastime for many, as well as being a source of enormous pride when your project comes into fruition. When people think about performing a cosmetic modification, a new paint job is what normally springs to mind. Nowadays their are many fun colours and finishes you can choose from. But it doesn’t stop at your cars body colour. You might choose to have your engine steam cleaned and have some chrome parts fitted to your engine. You can choose to change your car interior with some new sports seats, or have a new in car entertainment system fitted, that would include drop down video screens etc. The number of mods you can do in this area is phenomenal and you can have a lot of fun with it. No matter what your age. If your young and you have brought your first car. You may want to make that car your own by adding a few optional extras. A younger driver in their late teens or early twenties would be wise entering some some test quotes with the modification your thinking of performing on your car, just to make sure that it won’t push your modified car insurance price beyond your reach. Usually you can revisit any online modified vehicle insurance quote, by just logging back in to the system with the username and password that would get sent to you after you perform your first quotation. This can be an excellent way of tweaking your modified vehicle insurance and testing out different modifications to see what effect it has on your modified vehicle insurance cost. When you login, all your old modified vehicle insurance details will already be in the system, so you will only have to alter a small amount on your form, which will save you a great deal of time. From some of the tests that we have done, if your an older driver maybe 40 you can expect to get away with some really fantastic modifications with many types of mods, surprisingly; you may only need to pay only a few pounds extra on your modified car insurance. Typically only tens of pounds in many areas including performance modifications. While everyone’s circumstances are different and certainly where you live is going to be a major factor, you may be pleasantly surprised by your modified vehicle insurance quote if your an older driver. I hope this article has been a refreshing change from many others out there that are all doom and dead set against you modifying your car. 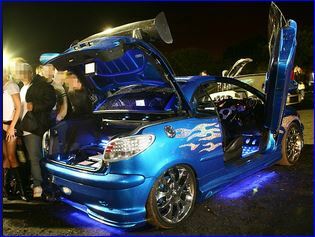 So if your thinking of pimping your ride, be sure to pimp your insurance and check out the fantastic comparison form provided by Seopa and get your modified car insurance sorted today.